Dani McCalla in front of the event planning board in the SAuCE office. Coming from Kingston, Jamaica, to the United States, McCalla is all too familiar with the various struggles international students face. Many take for granted the difficult transition that takes place when studying in the U.S.
What seems like important information for any first-year student is crucial for those who are also getting accustomed to a new culture. Through this experience, McCalla realized the importance of peer communication and networking. This motivated McCalla as she went on to get her bachelor’s degree in communications, and then her Master’s degree in student affairs. Currently, McCalla serves as the assistant director of Student Activities and Campus Engagement, known on campus as the “SA[u]CE” office. Upon starting her career at New College, it was obvious that McCalla was fully equipped and eager to begin improving the lives of students. The SAuCE office is committed to connecting New College students to the boundless opportunities that await them. McCalla collaborates with students and insists any efforts are student-led. Danielle also wishes to expand the Cross-College Alliance, a consortium of five institutions of higher learning in the Sarasota Bay area, which could enrich the lives of students from all schools. McCalla works endlessly to match the passion of the student body and create tangible projects that reflect the New College culture. 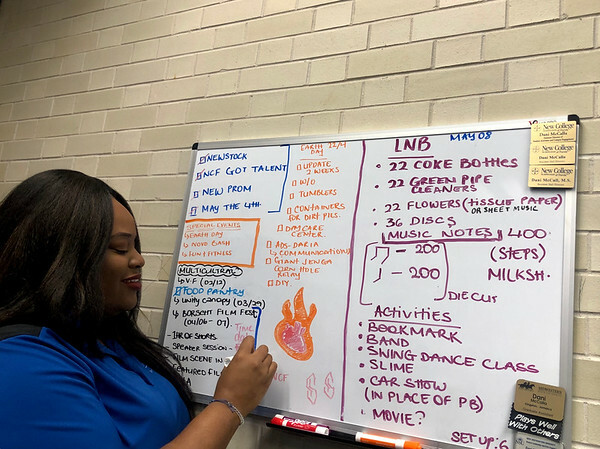 As for her vision for New College, McCalla dreams of seeing a Caribbean alliance club come into fruition as an effort to expand New College’s cultural awareness. — LilyAnne Rodriguez is an intern in the Office of Communications and Marketing.